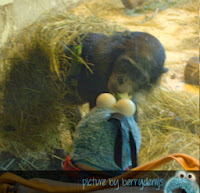 Cookie Report: Baby Bonobos Love Sesame Street too! 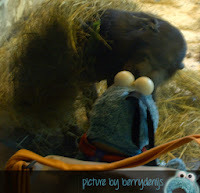 Last Friday me met the little Tigers, but did you know bonobo babies love Sesame Street too? Me sat at the window of their bedroom just before these beautiful animals would go to bed. They were already getting ready for bed. And like little children it is okay to watch a little Sesame Street before bedtime, right. So me sat for the window and me told a little bedtime story. Me thinks this little ape kinda liked it, because he stayed put for the whole story. Me just love it at Apenheul!